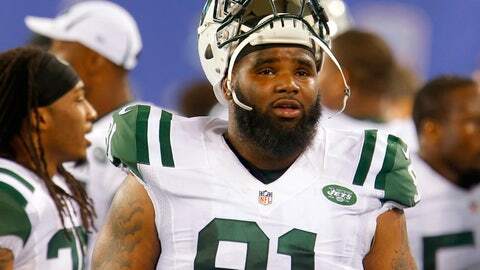 When the Jets take the field next, they'll welcome back Pro Bowl defensive end Sheldon Richardson. The New York Jets’ defense is off to a great start, leading the league in takeaways and points allowed. It’s hard to imagine Todd Bowles’ defense getting any better, but it’s likely. Defensive end Sheldon Richardson has served his four-game suspension and is set to return to action after the team’s Week 5 bye. Needless to say, getting back a Pro Bowler on defense is huge and the Jets are excited about his return. "[Richardson] gives us an extra weapon, extra depth down there," Bowles said via Ohm Youngmisuk of ESPN. "To me, he is a Pro Bowl player, he’s a heckuva player. Get him back in football shape and get him in the rotation and keep moving forward." Richardson will join a defensive line that features Muhammad Wilkerson, Damon Harrison, and stud rookie Leonard Williams. Since the Jets run a 3-4 defense, it won’t always be possible to get all four on the field at once, but no one’s complaining about that. "You don’t have a challenge finding places for good players to play," Bowles said. "You just play him." Richardson will make his much-awaited return against the Washington Redskins in Week 6 before the Jets take on the New England Patriots in Week 7. His return couldn’t have come at a better time.